The train, with over 360 people on board, was travelling from the Edirne region on the Greek and Bulgarian borders to Istanbul's Halkali station on Sunday. 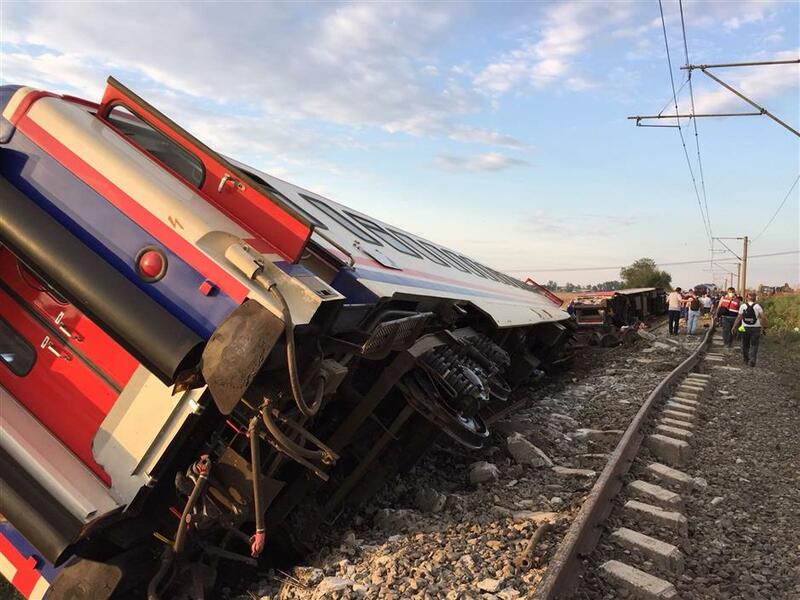 This photo take on July 8, 2018 shows a derailed train following a train accident at Corlu district, in Tekirdag. Twenty-four people were killed and hundreds injured when a train packed with weekend passengers derailed in northwest Turkey due to ground erosion after heavy rains, officials said Monday. Transport Minister Ahmet Arslan said that the latest checks on the rails had been made in April, Anadolu reported. Television pictures showed several train carriages sprawled on their sides, and shocked injured passengers being taken away on stretchers as rescue workers picked through the wreckage. President Recep Tayyip Erdogan expressed his condolences over those who lost their lives in the accident that he said has "deeply upset the whole nation". Turkish passengers have in general preferred taking planes or buses for inter-city travel but this has been changing with the new high-speed lines. The train involved in the accident appeared to be one of the slower passenger trains travelling on a single track line.